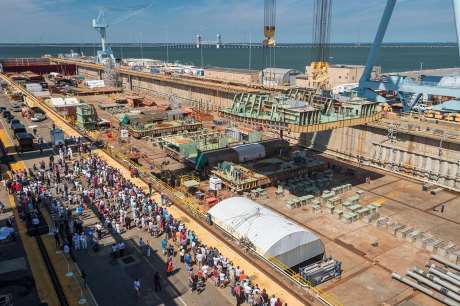 The keel for the US Navy's second Gerald Ford-class nuclear-powered aircraft carrier, the John F Kennedy, has been laid at a ceremony in Newport News, Virginia. The keel laying is the symbolic beginning of a ship's construction and the ceremony saw the ship's sponsor, Caroline Kennedy, declare the keel "truly and fairly laid". Kennedy, daughter of the 35th US President after whom the ship is named, is the US Ambassador to Japan and made her address to the ceremony by video link. The vessel, numbered CVN79, is being built by Newport News Shipbuilding, a division of Huntington Ingalls Industries. More than 450 of the ship's 1100 structural units have already been constructed since the first cut of steel in 2010. The first vessel of the class, the Gerald R Ford (CVN78), will be the first US aircraft carrier to be entirely electrically powered. Its two Bechtel A1B reactors are about 25% more powerful than the A4W units in the USA's Nimitz-class aircraft carriers and provide 2-3 times as much electricity. Huntington Ingalls describes it as "the most efficient aircraft carrier ever designed", requiring less manpower to operate and saving the US Navy more than $4 billion over the ship's 50-year life. The Gerald R Ford is due to be delivered to the US Navy in 2016.